Over the last three years, I have researched, read and reflected on compassion and how it shows up at work and home. It’s been a great exploration to find the many ways compassion is understood. It’s something we know by experience, and is less clear to define. 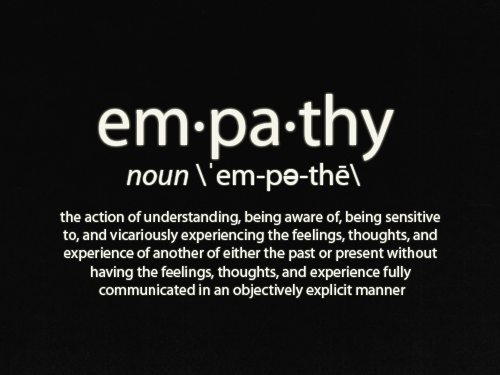 After many conversations and interviews, empathy is a key component to compassion, and is a skill you can develop. 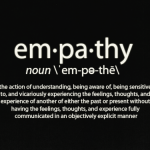 Empathy means to take the perspective of another person and understand their thoughts and emotions. We have a lot of complex processes going on with our brains, and it’s harder than it seems, especially if we’re triggered or feeling a threat. Developing empathy is fundamental to trust, collaboration and perhaps surprisingly, to accountability. My client “Shelley” said to me last week, “I just don’t get it…Jim gets too involved in the details and slows the team down. He needs to see the big picture faster, or I need to find someone who does.” Shelley is under a lot of pressure, and the stress causes her normally quick pace to speed up. She gets impulsive with decisions and can regret them once they are made. It’s a pattern she working to shift and move toward one that brings her team along with her rather than leaving them 50 steps behind her. So exactly how does empathy work? If it means seeing the world as someone else does, empathy means being non-judgmental. Judgment often shows up when others are different than we are, or perhaps where we are vulnerable. If I don’t share the same value of being strategic or fast paced, I run the risk of you not seeing the strengths I do bring since you are using only your lens to see me. In Shelley’s case, she is working to truly hear what Jim needs to be successful to see the big picture, not reacting to her own vulnerability and fear of failing to meet deadlines. I appreciate the 4-step approach to communication by Marshall Rosenberg which includes, “No matter what others say, we only hear what they are observing, feeling, needing and requesting.” When we listen through this empathic lens, rather than our own feelings and needs, we have a much better opportunity to build trust and get meaningful results for both of us.